There is an abundance of life in the deepest parts of the ocean that you wouldn't even imagine! 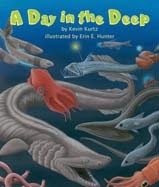 A Day in the Deep by Kevin Kurt and Erin E. Hunter explores the ocean depths and features many fascinating creatures and how they survive in these dark habitats. to hide from an oncoming shark." The difficulty of the vocabulary along with the rhyming text make this book best suited for reading aloud to a young audience. The full-page glowing illustrations hold young kids' interest and pique their curiosity. 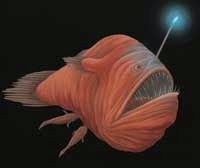 Did you know that some sea creatures can light up? Or that some creatures never, ever see the sun? These and many other facts are covered in this book. The "For Creative Minds" section includes activities about deep ocean habitats, ocean life zones, glowing animals, and life under pressure. This cross-curricular book covers language arts, math, and science skills and is correlated to core and state standards. Visit the Arbordale website for free teacher helps, including a downloadable activity guide with lesson plans and worksheets.